A2 Hosting offers top notch VPS hosting. 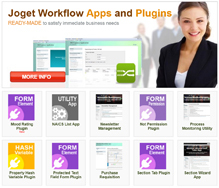 Easy Tomcat Install – Tomcat is required to use Joget Workflow. A2 Hosting has got you covered! Use the exclusive A2 QuickInstaller to add Tomcat to your VPS Hosting account in a matter of moments. 100% Scalable VPS – A2 Hosting’s staff will help you find the perfect VPS package for your Joget Workflow install. When the time comes when you require more resources, just contact A2 Hosting and they’ll seamlessly move you into a more appropriate package. UCG offers Joget Workflow Compatible VPS and Joget Workflow Ready VPS Hosting. Both solutions come with the popular hosting management panel “cPanel/WHM” for easy files/services management. UCG also offers custom builds, security, implementation, backup and data recovery solutions as add-ons with 24/7 online support in 3 languages: Arabic – English – French. To sign up as a JOGET Hosting Partner, please email info[at]joget.org.